What does a Pediatric Dentist do? I mean, what do we actually do on a daily basis? 1. Teeth coming in behind baby teeth. Every day, I mean every day, a child (or several children) presents with this. 2. 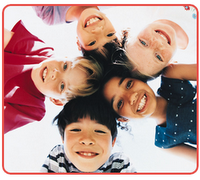 Chipped or Fractured Teeth-Usually after a long weekend kids show up with small or large fractures of their teeth. Some we just smooth and some need a composite buildup to restore. 3. Premed or Sedation Cases. These are usually the longer operative cases of the day. These are children who need conscious sedation for the longer or more complicated work they require-this can be anywhere from one tooth to multiple quadrants of dentistry: white fillings, stainless steel crowns, Pulpotomies, extractions, Space Maintainers. 4. Routine operative dentistry-one or two fillings, one crown, a couple of extractions for orthodontic reasons, etc. on more cooperative patients. 5. Occasionally the tooth ache, Ulcer, or other odd things that need a dentist's eye. 6. Orthodontic adjustments-not too many for me as we have a couple orthodontists that handle most cases. Still, I have a few Crossbite corrections etc. 7. AND--of course the many hygiene examinations we do throughout the day. Hospital Cases on Fridays. What I do not see on a regular basis is something like that that I saw the other day. A "routine" examination of new patient. Yes, one or two cavities, but an evident large swelling in the mandible the size of a golf ball. X-rays, discussions with the other docs in the practice, and finally a referral to an oral surgeon for followup and likely surgical removal of an obvious tumor. Yes, we do see things like that and need to be prepared and educated to make the right decision. That kind of case makes the whole day much more interesting and rewarding. I could not find an email address to contact you privately.. sorry to do it here. I'm am so scared for my son. I'm an American living in The Netherlands. My kids were born here and are half dutch (father is dutch). My son is 6 and speaks mostly Dutch. He also has pddnos which is a very mild form of autism. It took until age 6 to get him in a dentist chair for a checkup. We brought him to ours from age 2-3 and always they said if he didn't want to open his mouth it was ok, come another time so as not to scare him. We finally got him brave enough to do this with children's books, etc. Gosh he was such a good boy, and brave too! My fear came true. He has 3 cavities all in the back. I immediately said he will need to be put to sleep. We go to a special dentist for people who are scared and they offer a sleep option. Lots of kids seem to be put to sleep and I think for him it will be best. He would be traumatized being away for that. The dentist said she will fix the cavities, clean his teeth and put a sealant on them to help protect them better all while he's asleep. He's never had his teeth flossed. When I was growing up it just wasn't done on baby teeth. I never flossed before like age 12 and I never had a cavity until I was 15. So how can I introduce my 6 yr old special needs son to flossing? I want to help him and keep him healthy and establish good habits. We are lucky he listened to the dentist and has brushed 2x a day every day since the checkup and knows he cannot have anything but water before bed. Do you have any tips for preparing him for the big visit where he will be put to sleep? They had us visit a counselor for like 10 minutes to explain but it I could tell he didn't understand. Do I keep him home from school the day after? It will done on a Tuesday morning and he will miss school that day. Should he stay home Wednesday as well? I could ask the dentist all this but I feel more comfortable using English!! thanks for your time and advice! Children with special needs like Autism often need more attention to the more routine elements of dental care such as flossing. There is no magic method. You will likely have to find what works for him. There is more here on sedation and general anesthesia and the treatment of very young children here on the blog. As far as general anesthesia and the like, most kids "recover" quite rapidly and are back to their normal activities by the next day. I would not make too big a deal out of it to him. I am sure he will do fine. Good Luck. sorry, I had no idea where to put this. I had a baby tooth that would not come out so my orthodintist pulled it out and gave it room for it to come in while I had my braces on. It's been a year and 3 months and it hasn't even poked out or anything. He suggests seeing an oral surgeon. What would they do there and would it be expensive? Exposure to aid eruption is not a difficult thing, but you need to ask your dentist and oral surgeon what is involved in your case. Sometimes an exposure is followed by orthodontic moviment to get a tooth to "come in" by sticking on a little bracket and moving the tooth in with orthodontic appliances. Great site, glad I came across it. My son is 13 and has braces, for the second time. First set moved his baby teeth so permanent teeth would come in proper locations. This set is to position them properly. We have known for quite some time that he is naturally missing two permanent teeth. The ones on either side of his two front teeth (upper left and upper right lateral's I believe). He is about to get his braces off in 2 months and we need to address these two space where his teeth should be. Currently the orthodontist attached 2 fake teeth to the wire to fill the gaps. In your opinion is 13 to young for implants? Is a retainer with 2 fake teeth the best option until implants can be done? what about a fixed Bridge? He is at that age where spaces in his mouth just wont work socially, and we don't blame him. Another issue, he has mismatched front teeth, one is wide (fat) and one is much narrower. Also he will be starting wrestling soon and will be needing to wear a mouth guard. The orthodontist told us today he wants us to consult our dentist about the implant and tooth sizing issues. Until today we thought he was addressing those issues with us. I have scheduled a consultation with our dentist for late next week but it's clear to me you know what your talking about and I would like to go into the consultation informed. Thanks for your time. I cannot tell you what is best for you. Discuss things with your dentist and orthodontist as each case is different and multifactorial. I have had cases of missing laterals that a removable retainer is used toll growth is finished in order to do implants-Many cases I have seen are handled kind of like the one in the linked post above orthodontically. Which is best for you will be coordinated between your dentists. I am sorry to post it here! But I am scheduled for an interview at a university for pediatric residency program. what do you think are qualities they look for in a candidate. Also why did you always wanted to be a pediatric dentist?????? You can read what I have advised others that have asked similar questions here on the blog under the dental school section (over there on the sidebar). Basically, they are looking for a well rounded person who presents themselves well and can demonstrate they can interact with the public. They are looking for an academically capable individual who can do well with the residency and spend the hours and hours dedicating yourself to the rigorous program they have ahead for you. I mean Pediatric Dentistry residencies are pretty competitive. If you have snagged an interview that is a good sign. You can say you love children, but it is better to demonstrate it -and it's more than just that-they can tell. 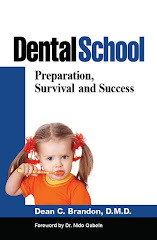 You should demonstrate you have some knowledge of what pediatric dentists do (different from general dentists). They may ask how many stainless steel crowns you have completed (just to get an idea if you have some experience there). It always helps to have some research experience or show some interest there. Depending on the program they may look for different things. Good Luck. Let me know how it goes and where you end up! Hello! I am an RDH working in several pediatric offices in Los Angeles. The most important thing is to keep the parents informed on how to get their children to brush. I see alot of kid's who are not flossing. There are so many great products in the market today to making flossing easy and fun. I get alot of complaints from parents that they cannot get their children to brush long enough. In that case I would recommend buying toothbrushes with built in timers they come with flashing lights as well as music. A very popular one we give out is called that Firefly made by Dr. Fresh it's available at most drug stores for about $3.00 You can also go for an electric toothbrush like the Crest Spin brush they also come in a variety of characters but they can be a bit pricey. Like nearly everyone else, I found you blog while doing a Google search for something specific about my daughter's teeth. My daughter has shark teeth but you closed comments on that post and don't have an email contact listed so I'm posting here. I hope you don't mind. I've linked to your "shark teeth" post on my blog. I came cross your blog by google search of tooth spacer and learned a lot from your blog on that topic. Thank you very much. Unfortunately it didn't take comments any more, so I posted my question here. My 6-y son got a tooth spacer several month ago when one of his back tooth was taken out due to decay and infection. Now the tooth on which the spacer was fixed on had the problem. The gum is swelling and showing inflammation for some unknown reason. The dentis took a X-ray showing the root is being absorbed and suggested to remove it again. In that case, my son will lose the two teeth in a row and has even bigger space. The 6-y molor is on its way, but has not fully erupt yet, so it is not possible to put another spacer. The dentist said the gap will be left as is and he has to see the othrodontist much early to correct the position issue if any down the road. My question is what may cause the inflamation? Why is the tooth root being absorbed at the time it should not be yet? Are these issues going affect the adult teeth or the 6-y molor? It seems to me that nowadays the decision of removing baby teeth is too easy. One reason I closed down the post to comments on spacers was that there were simply a whole lot of comments there. Aa you can read a spacer is often necessary. Now why areteeth resorbing? Can be due to a carious (cavity) experience. Sometimes some kids are particularly prone to premature resorption. You cannot "fix" a tooth that is not "fixable". Often baby teeth do not lend themselves as well to the same solutions that are available for permanent teeth. I am peter a new dentist of dental implant PA. Anyway, I totally like all your links. It's full of article posts that are informative. I bit that's the reason why your blog is popular and you have a lot of people visiting it and one of them is me. I'm totally inspired. Thank you! I am a concerned mother of 3.5 year old. My son is facing some critical issue with his tooth/gum, we have seen few dentist though, but couldn't reach to any conclusion. I hope I can get answer of my queries here. My son had a pinkish dot on one of his tooth in lowe jaw, around 8 months back. When we consulted with a paediatric dentist, she suggested that its due to internal re-absorption. However over the months, that turned in to a greyish spot. Now it looks little yellowish spot. Around 20 days back, he started complaining about some intermittent minor (not severe) pain in his lower jaw, around that tooth. When I looked around, I saw some sort of swelling around the gum. Consulted with our dentist, she said lets wait for a week then will take an X-Ray of it. But over a week time, I could see a boil beneath the tooth on the same gum, with some pus. We started giving him, Amoxicillin 125 mg/5 ml syrup (5 ml twice a day), for 5 days. His pain subsidised, as well as we could see the boil with pus also started normalizing. Now our doctor is suggesting us to go for either a RCT or tooth extraction. I am not sure, what to do. I not sure, for a 3.5 year old, how complicated these procedures may turn up. Can we avoid these ? As he is not experiencing any pain or discomfort now, can we wait and watch ? If NOT, which way should we go for (RCT or tooth extraction) ? What will be the safest way going ahead ? Please refer below link for some of tooth X-Ray images. I shall wait for your response. Well, true root canals in baby teeth are not always the best choice. Once a tooth is infected/abscessed, I usually recumbent removal. See my other posts on cavities, root canals, etc. Most front teeth do not need space maintenance, but back teeth ofter do, so read about that as well. It's all linked on the sidebar.